I had no plans to run San Francisco Marathon this year, or really, any time in the near future. SF Marathon was a bucket list race that I was intimidated by, with it’s hills, oh those steep, steep hills. 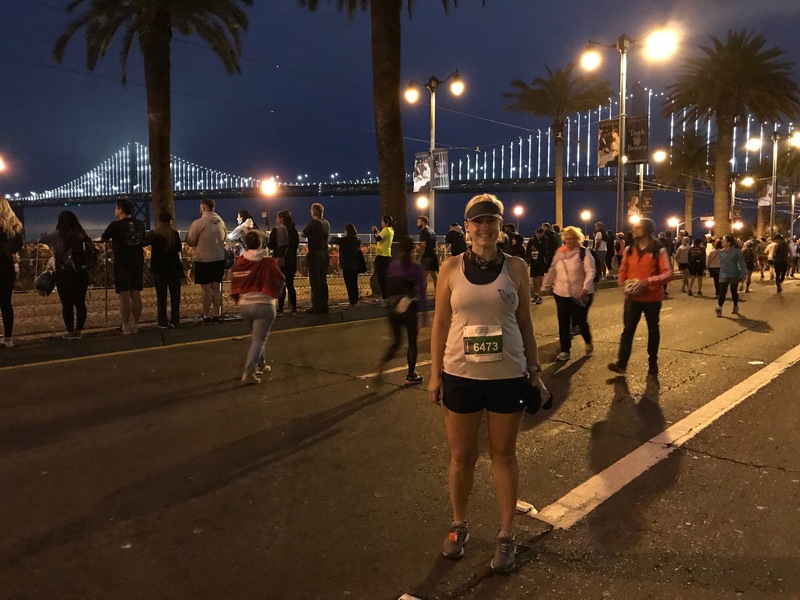 I’m from the Bay Area, and lived in SF for about four years — I love my home city, but couldn’t fathom running 26.2 miles of it. This year, 2018, it was off the table as Mike had signed up for Ironman Whistler, which took place the same day as the marathon. Due to a nagging injury, Mike deferred his entry at the last minute, which of course freed up our weekend. I was disappointed we wouldn’t be taking our trip anymore, but also didn’t want him racing 70.3 miles on a bum ankle.I had a four day weekend off from work and I wanted to do something. A few days after my 37th birthday and a week before SF Marathon was to take place, I signed up. 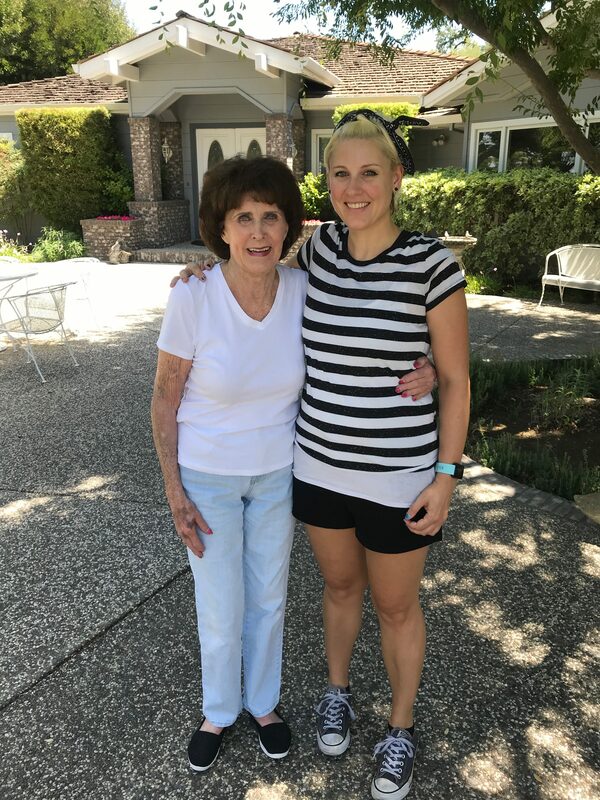 It was impulsive and I hadn’t trained at all, but it was a chance to see my grandma and cross SF off the list! My last race had been about a month and half prior, the Valley Crest Half Marathon. In the time off, I’d been riding my bike to and from work at Planet Fitness (8 miles roundtrip) and working out with the trainer there. I had been running here and there, but mostly lifting weights, doing interval training, and using the Stairmaster. For the trip, we decided to fly instead of drive up, as ticket prices were fairly reasonable. I went a day early, on Thursday after work, at the Ontario airport in the Inland Empire. That airport is a breeze! After the hours of delays on our last flight, to New Orleans through LAX, checking in, security and the flight were a dream. 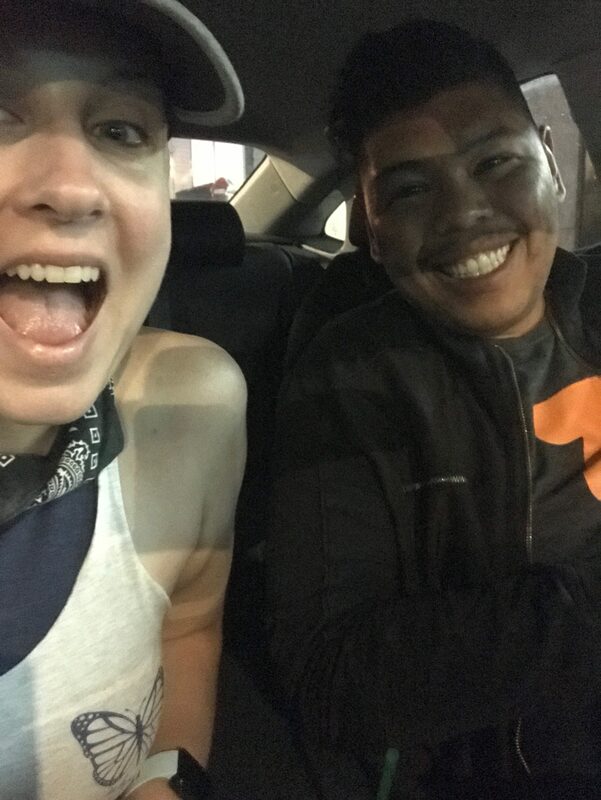 I took a Lyft from the Oakland airport to my grandma’s house in Redwood City, which wasn’t cheap, but less expensive than flying into San Jose or San Francisco. Mike would be flying into San Jose the following evening and getting a rental car there. 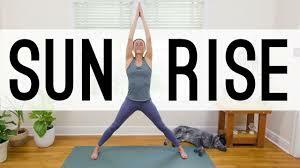 Friday morning I slept in, did some yoga, and ran a couple miles to shake out my legs. I was hitting between and 8 and 8:30 pace pretty comfortably, which was both shocking and exciting! I’d been struggling to get my pace out of the 9:30s for what has felt like years. I was feeling rested, strong, and only slightly in over my head. The goal was for one of us to bring a home a medal that weekend but a marathon? With no training? The last time I did this, I ran Long Beach Marathon, and I PR’ed, which was my secret goal for the weekend. I wanted a marathon PR for my birthday! Mike arrived later that afternoon, and after he settled in, we went for a three mile run together through the neighborhood. We made dinner and planned to hit up the expo the next day in San Francisco, which would be about an hour drive for us from Redwood City. I wanted us to get back in time to help my grandma run errands before dinnertime, so it was going to be a full day! After breakfast on Saturday, we made our way to the city. I absolutely love driving through San Francisco, the memories of my time there always come flooding back! My legs ached just cruising over the hills on Market Street, through the Mission District to the Marina, for the expo. The expo was held at the Fort Mason Center, which was an area of the city I had not spent much time. 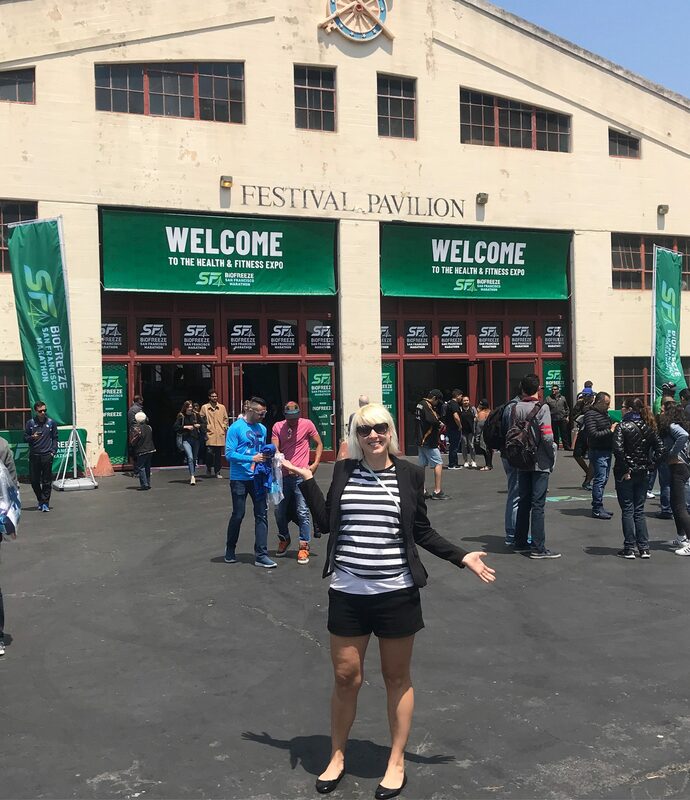 The expo was small, in and open and airy building — the expo didn’t have the razzle dazzle of the Rock’n Roll races or LA Marathon, and it felt very San Francisco in that way! There were kombucha, beer, and wine samples outside, Ocho samples inside – and I sure do love samples at an expo! We refrained from alcohol, but indulged in kombucha and candy. It was time to get my bib though, and start the trek back to the peninsula so we could help my grandma with some errands around town. Because I had signed up for my race so late, I didn’t get any emails about the expo or my bib number, but since this wasn’t my first rodeo (marathon #6) I knew it’d be fine, I just needed my ID, and confirmation I had in fact signed up for the race. Bib pick-up went without a hitch, as did tech shirt pick-up. They are long sleeved, which are my fave. I love winter training in Socal with a long-sleeved tech shirt and shorts! My weekend was free, why not? On our way home we stopped at Rainbow Grocery, San Francisco’s vegetarian grocery store! I used to spend a lot of time there, as a worked down the street and also, cause I’m vegan. Mike picked up some raw collard wraps, I got some vegan shrimp and Violife parmesan. I was gonna have pesto and shrimp pasta for dinner — I couldn’t wait! The top window, of the apartments over Elite Sports, was my old living room window! It was so special to run right by it on the course! Because signing up for this marathon was so last minute for me, I didn’t have any running shoes for it! My feet hurt in my Skechers during RnR San Diego, which meant it was time to retire them. I brought the Skechers with me just in case, but they didn’t have the oomph to get me through 26.2 miles and I don’t have the gait to run in whatever — I need supportive shoes! It’s like the biggest no no to get new anything the night before a race, but desperate times, what can I say? Even though I felt like I could PR this thing, there would be no regrets if I didn’t, but I wasn’t worried about falling short with new shoes. I did tell Mike on the way to the expo I wanted to PR in which he basically kicked me out of the car. JUST KIDDING! But he did ask me pretty incredulously if I even knew how many hills SF had. YES MIKE, I am aware, haha. I got a new pair of Asics at Road Runner Sports in San Carlos. I usually have great experiences at Road Runner, but this was not the day for that. If I didn’t need a pair of shoes, Mike and I would’ve left, but my options were scarce and time was running out. There are much worse things in life that terrible customer service, but it was pretty appalling. Good thing I already knew my fit and what I was looking for! 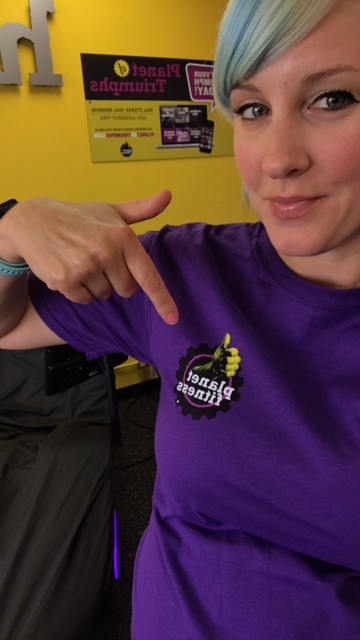 Flat Jenny ready to go! 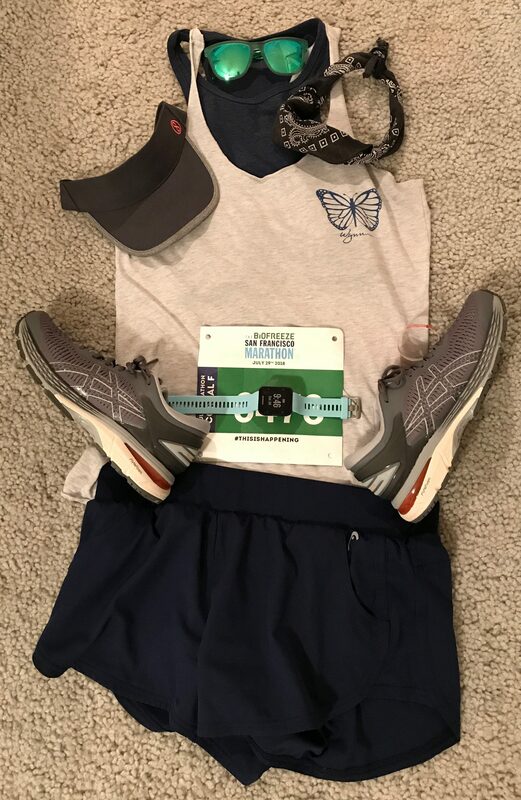 I don’t put out a flat runner for very many races, but I knew organization would help me with my PR goal, plus I wanted to build an outfit around my new Asics! Dinner was eaten, my flat runner was laid out, and I was as ready as I was going to be! 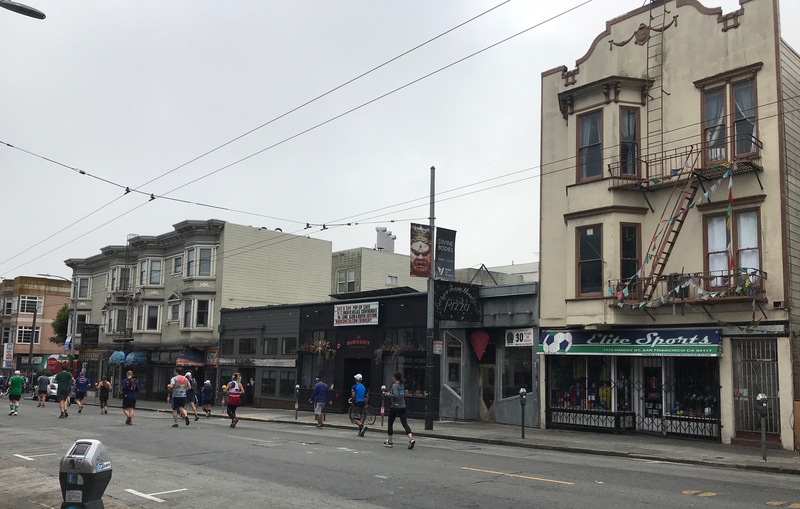 I was very excited about the route, especially running out of Golden Gate Park and down Haight Street because I’d be running right past my old apartment in the Upper Haight! The race had an early start time of 5:30am. We hadn’t reserved a parking space like we did for RnR SF, so if anything Mike would drop me off and head to a coffee shop. I told him not to worry about cheering me on throughout the race — driving and parking in SF is a nightmare, and much of the route would be hard to get to if you weren’t familiar with the city. I was more than able to run this alone. We left my grandma’s house around 4am, and it was CHILLY. San Francisco summers are cold, and I do not miss that at all. We had to circle city blocks downtown a few times, but Mike was able to find parking maybe half a mile from the start line. I ate a bagel and cream cheese in the car, along with some coffee. Nerves were starting to get to me, and I didn’t want to get out of the car. When the morning comes, I am usually in disbelief I’m about to run 26.2 miles, that the next few hours will be me, traveling a marathon, on foot. It can be tough one to wrap my head around, no matter how many start lines I’ve toed. I did not want to leave the warmth of the car! 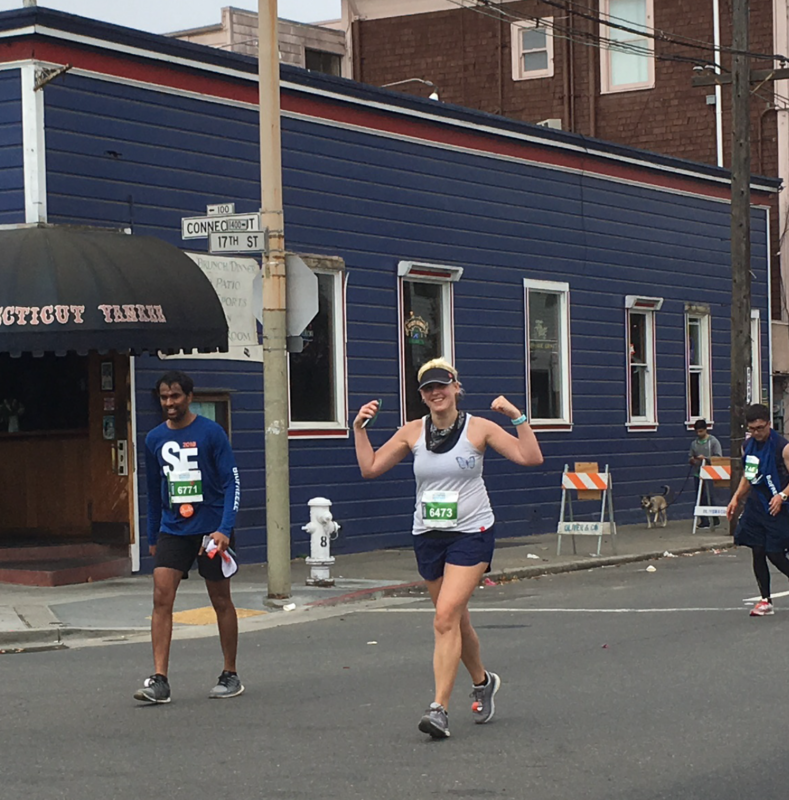 San Francisco Marathon boasts a hefty number of runners for the weekend, but the race felt small. 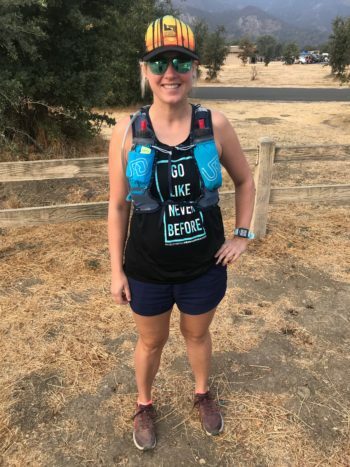 They do offer an ultra marathon the night before and two half marathons, so runners start at different times and places throughout the night and morning. The start line was very organized and even though I was in the last corral to take off, I was over the start line by 5:45am. I took the first half very conservatively, and made a pee stop at a port-potty before going over the Golden Gate Bridge. I was here to have fun and run my city. I am a huge fan of an early morning race! I don’t know what got into me at this start line, but I started crying before getting into my corral. Mike thought I was overwhelmed at the distance, but it was being home, and the excitement over running my old city streets that got me all choked up. This was really happening! 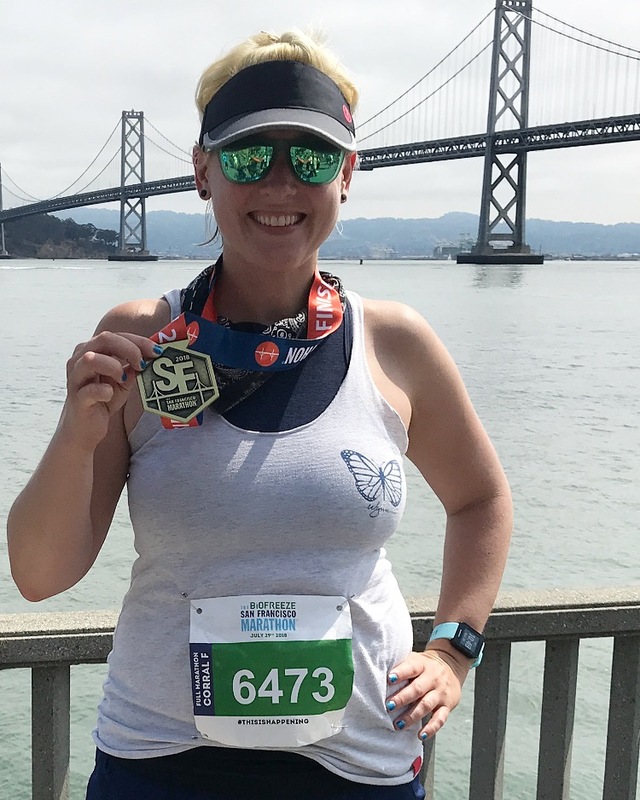 I am so grateful we ran RnR SF back in April because that half marathon was pretty much exactly the first half of SF Marathon. 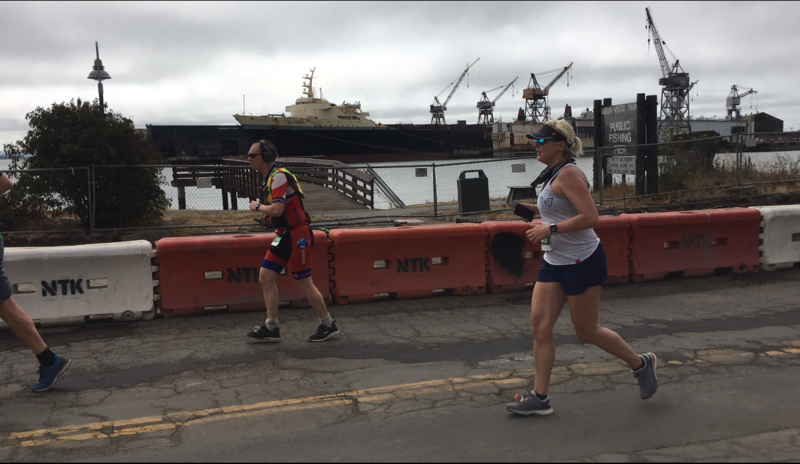 That coincidental course preview really gave me the confidence I needed during such a hilly race – I highly recommend running RnR SF if you are thinking about or signed up for SF Marathon! The morning was beautiful, with the Bay lapping up onto shore, a cool breeze and fog layer. I don’t take pictures while I run, but I do wish I had some of the course. (Here’s a great recap if you’d like a more technical recap of the race with pics!) If you’ve been with me for awhile, or follow me on Instagram, you know that I had the opportunity, through LA Marathon, to run Marathon Nice Cannes in France. 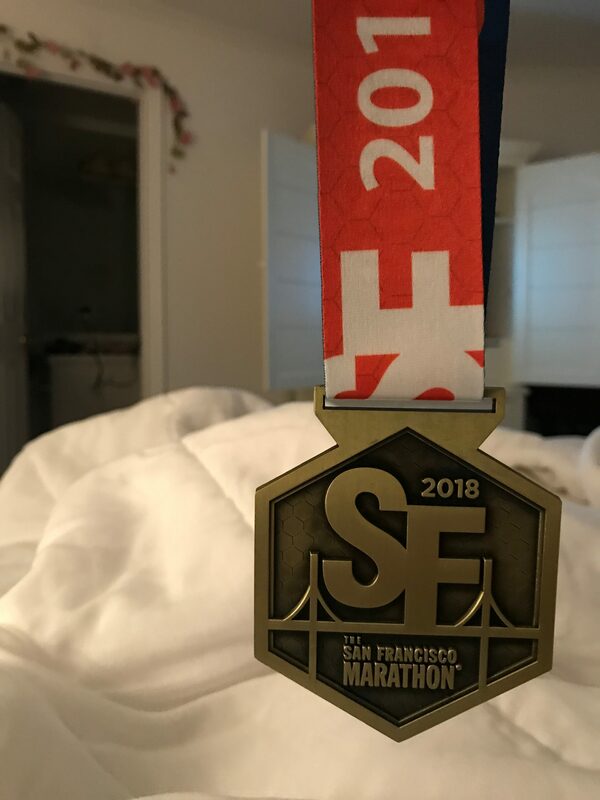 SF Marathon reminded me of that experience with the expo, the landscape, the weather, and the accents I heard along the course. The course is just beautiful and the layer of fog makes for a pretty majestic experience. After the Golden Gate bridge you run through the Richmond District to Golden Gate Park. I was really surprised at how great I felt. The park is green and lush, but for me, that part of the course did drag on a little — you’re in there from mile 14 through 19. Feelings strong during the last few miles! I was looking forward to the exit of the park because then we’d be on Haight Street and in my old neighorhood! Some friends of mine were from LA were cheering the LA runners and I was so excited to see them and point out my old digs! I stopped to take pictures and soak in my old stomping ground, wishing that Mike was there to show him, but that day will come! And then it was time to finish the race, with only about a 10k to go! I ran down Haight Street, through Duboce Triangle, where Mike was waiting on a city bike! Then it was through the Mission, Potrero Hill, and then more industrial parts of SF. I used to work over there, and the memories of walking those streets came flooding back. I was feeling great, the best I’d ever felt at that point in time during a race . Don’t get me wrong, my legs were talking to me after all those hills, and though the second half of SFM is mostly downhill, it definitely still has some uphills! I knew around mile 18 I was on track to PR, even with a long line at the Port-o-Potty earlier in the race and photo stops. In the couple of miles before getting to AT&T Park, I had to start walking a little. BUT I WAS SO CLOSE!!! Mike was following me on a city bike and was impressed by how I was holding up, he said it was the strongest he’d ever seen me at that point in a marathon. Then it was around AT&T park and through the finish line to my new PR! I finished the race with a 4:56, which is a two minute PR for me! I have my Garmin on autopause, and so without the wait for a pee break at about mile 7, I ran a 4:51! It’s a small victory, but a victory nonetheless and one without a marathon training plan. Maybe not training for a marathon is my new training plan!!! Big hair, big mood! New PR! I’ve come a long way since I started running, physically and mentally. 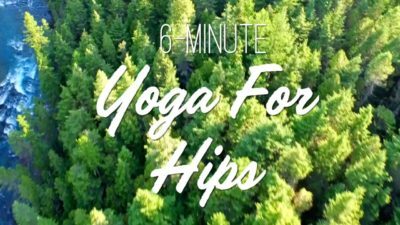 I had a hard time getting into, and then actually cross-training, but it’s helped my running immensely. I had talked myself into SFM being too advanced, too hilly, too hard for me to tackle as a runner, and there I was, medal around my neck with a new PR. Always difficult to leave the Bay and my Grandma. The rest of the weekend we spent time with my grandma, and departed the Bay from San Jose airport to Long Beach airport. It was my first time traveling through either of those airports and it was so easy! We stopped for dinner at Seabirds and made our way back to Claremont. 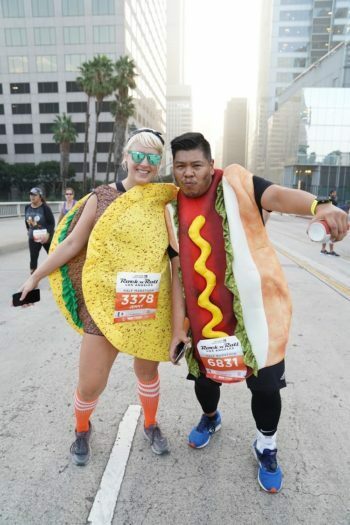 I took a few weeks off from running and then it was time to get ready for…Bulldog 25k!